Fernando’s participation in this year’s Indy500, one of the Triple Crown of motorsport [the Monaco Grand Prix, the Indy500 and the Le Mans 24 Hours], is a fantastic opportunity for all those involved, and it realises a dream Fernando has had to compete in other legendary motorsport events around the world. Fernando will race for McLaren-Honda-Andretti team with Honda powered 2.2-litre twin-turbo V6, limited by IndyCar regulations to 12,000rpm. The car will be run by the Andretti Autosport team, headed by founder, owner and Chief Executive Officer Michael Andretti, a former IndyCar champion who raced in Formula 1 for McLaren. 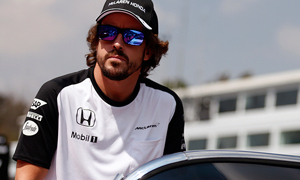 Fernando will also be a team mate of Takuma Sato, a former F1 driver who joined Andretti Autosport from 2017 season. Andretti Autosport will be racing in Indy500 with 6 cars with Honda engine, including Fernando’s McLaren-Honda-Andretti. Since the Indy500 will take place on May 28th, the same day as the Monaco Grand Prix, Fernando will not race at Monaco this year. The Indy500 will be the only 2017 IndyCar race in which Fernando will compete, however, and the Monaco Grand Prix will therefore be the only 2017 Formula 1 race in which he will not compete. In due course McLaren-Honda will announce the identity of the driver who will race Fernando’s car at Monaco.